We’d love your help. 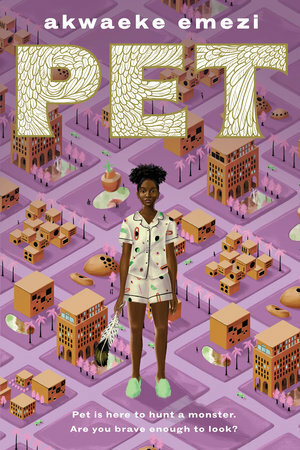 Let us know what’s wrong with this preview of Pet by Akwaeke Emezi. Pet is here to hunt a monster. Are you brave enough to look? There are no more monsters anymore, or so the children in the city of Lucille are taught. With doting parents and a best friend named Redemption, Jam has grown up with this lesson all her life. But when she meets Pet, a creature made of horns and colours and claws, who emerges from one of her mother's paintings and Pet is here to hunt a monster. There are no more monsters anymore, or so the children in the city of Lucille are taught. With doting parents and a best friend named Redemption, Jam has grown up with this lesson all her life. But when she meets Pet, a creature made of horns and colours and claws, who emerges from one of her mother's paintings and a drop of Jam's blood, she must reconsider what she's been told. Pet has come to hunt a monster, and the shadow of something grim lurks in Redemption's house. Jam must fight not only to protect her best friend, but also to uncover the truth, and the answer to the question-How do you save the world from monsters if no one will admit they exist? To ask other readers questions about Pet, please sign up. If I had to choose only one author to read for the rest of my life, it would be Akwaeke Emezi. This book is beautiful and brilliant, and I will carry Emezi’s words with me for a long, long time. Absolutely excellent YA novel from Akwaeke Emezi! Young trans teenager Jam lives in Lucille, a city that has long since purged their community of "monsters." No one can imagine such creatures returning, so it's little surprise that Jam and her family are shocked when a painting of a beast comes to life and claims to have been summoned to Lucille to hunt a monster. Worse still, the beast claims the monster lucks within in the home of Jam's best friend, Redemption. Intriguing, intoxicating, and th Absolutely excellent YA novel from Akwaeke Emezi! Young trans teenager Jam lives in Lucille, a city that has long since purged their community of "monsters." No one can imagine such creatures returning, so it's little surprise that Jam and her family are shocked when a painting of a beast comes to life and claims to have been summoned to Lucille to hunt a monster. Worse still, the beast claims the monster lucks within in the home of Jam's best friend, Redemption. Intriguing, intoxicating, and thought-provoking.